There hasn't been much knitting going on around here, so I thought I would share my last completed project (well, semi-completed). It was a failure. 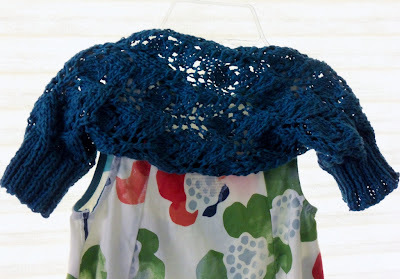 Do you remember the lace shrug I raced to finish before Lily's first birthday? I knit it to go with this dress that I bought her online from Nordstrom.com. It was touch and go for a while, but I managed to sort of finish it in time for her birthday party. It's supposed to have a ribbed neckline, but I left it off. Here's a shot of the back. It's pretty, but I have to admit I am not a fan of shrugs. They seem a bit silly. I considered knitting a cardigan, but decided a shrug would be faster and easier to complete. The dress was a little big, and the shrug was waaaaaaaay too small. There was no way to get both of her arms in the sleeves. I'm sure the problem was me and not the pattern. I haven't felt like knitting very much since the shrug fail, but I'm hoping that is going to change. Today I listened to a 2010 interview with knitting designer Nicky Epstein that inspired me. She is funny and down-to-earth and has great stories to tell. If you would like to listen to the interview, you can find the free podcast on the CRAFTCAST website and on iTunes. If you want to download it from iTunes, search for "Craftcast" and look for podcast #34. There is nothing worse than a knitting fail. I just, in fact, threw out a project. I was going to try and save it but realized it just wasn't going to ever work right. It felt good to rinse my hands of it and tackle something else. But it was depressing nonetheless. I am so sorry to hear of the shrug fail. It looks cute but how annoying that it didn't fit (by the way, I completely agree on the not being a fan of shrugs...I feel the same). Every time one of my knitting projects fails I swear up and down that I will never pick up my needles again, but that never lasts for long. We all have knitting fails from time to time (I sure have my fair share). I totally get it, it can be impossible to get going on it again. But look at all of the amazing things you have knitted in the past! You are a fantastic knitter capable of making anything you set your mind to. I say start again on something simple and relaxing, your mojo will come back to you! :( i'm sorry for the shrug fail but it's still pretty. The color is a beauty. Are egg - that's so frustrating. I'm sorry it didn't fit, cause it sure is cute! Have you read all the fuss about the Ravelympics??? HAHAHA - that was supposed to be aaarrrrggggg - spell check corrected it!!! Well, I think it is cute! Sorry it turned out a little small! I bet she loved it anyway! Have a blessed day my friend, HUGS! Oh Bummer Stacy, but you know what? Yarn is forgiving. If you want you can rip out and start over making the shrug bigger, or else continue on and make the cardigan you mentioned. I think whatever you do Lily will love it because you my dear are a super aunt. Mistakes happen, and I know you will overcome the funk of not wanting to knit. Just sit back, relax, and choose something super easy and not requiring a lot of attention for now.